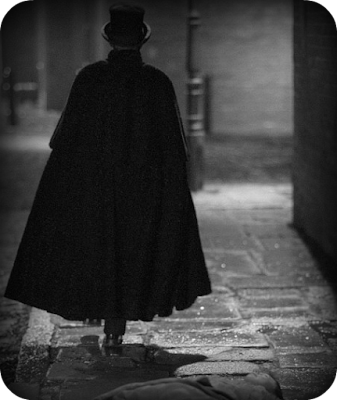 A/N: I will probably post some more detailed stuff on aspects of this in the future, but for now here's an introduction to Jack the Ripper and my stance on some of the big debates within 'Ripperology'. The popular image of Jack the Ripper - a top hatted Toff disappearing into the swirling smog of a London night. 38-year-old widow Annie Millwood was attacked by a man with a clasp knife he pulled from his pocket. She was stabbed repeatedly in the legs and the lower part of the body, though made a full recovery. This may well have been an early 'Jack' attempt, but Millwood died of natural causes at the South Grove Workhouse on March 31st, before Jack began in earnest. The first of the Whitechapel Murders, that of 45-year-old 'unfortunate' (i.e. a poor, casual prostitute) Emma Smith, was begun in the early hours of the morning. Smith was viciously assaulted by a gang of, in her own words, two or three men, one of whom was a teenager. (Such 'high rip' gangs commonly preyed on prostitutes for their night's takings or the simple fun of it.) Nevertheless she managed to walk to her lodging house, get to hospital, and be examined by a doctor before falling into a coma and dying of peritonitis the following day. The police were not informed until the Friday. Most modern writers wonder at her death ever having been linked to the Jack the Ripper killings, what with the obvious difference in the MO. The press linked Smith to Jack from September '88 however, and Smith's story certainly had its holes - though whether they were covering Jack, a pimp, or some other shady character, it is hard to say. 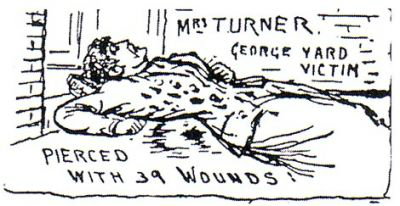 39-year-old Martha Tabram (aka Turner) was found dead on the landing of the George Yard Buildings. Mary Ann Connelly, a known prostitute who went by the name Pearly Poll, came forward to say that she and Tabram had been drinking and soliciting together the night before. They had picked up a pair of soldiers and, the last Poll saw of her, Martha went off with hers in the direction of George Yard Buildings. Initially this seemed a good lead - P.C. Thomas Barrett had seen a soldier loitering in the vicinity in the early hours, claiming to be waiting for a chum who was with a girl, and Tabram's fatal wound looked like it had been caused by a bayonet. But. That wound was re-categorised at the autopsy - it was probably inflicted by a sword stick (which sounds very upper class, but could be picked up for a few pennies on the streets of the East End at the time) - and both Barrett and Poll failed to pick out soldiers without ironclad alibis at identity parades. Henry Turner, who had been living with Tabram until about three weeks previously, said there was no way she would have been out consorting with Pearly Poll, and the police were highly dubious anything Poll had told them was truthful. I tend to side with the argument for including Tabram in Jack's tally, and highly recommend Tom Westcott's The Bank Holiday Murders: The True Story of the First Whitechapel Murders for more on why this is likely. From the Illustrated Police News. Tabram's marriage broke down in 1875 due to her heavy drinking. She then lived on and off with a carpenter named Henry Turner. By August 1888 Tabram was living alone in Spitalfields' lodging houses, funded by street hawking. 43-year-old unfortunate Mary Ann 'Polly' Nichols was found dead in Buck's Row by two men on their way to work who, even as they went in search of a police officer, were unsure if she was dead or just dead drunk. In fact her throat had been cut and her abdomen mutilated. Nichols had last been seen at 2:30am, very drunk, claiming 'I've had my doss money three times today and spent it' and wouldn't take long in getting it again. (A single bed in a common lodging house cost 4d, and Nichols could expect to earn between 2d and 4d per customer.) Nichols was attacked only minutes before being discovered but nobody in the surrounding houses had heard anything, and there were no clues to go on. Mary Ann Nichols. 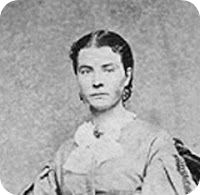 Nichols and her husband William had five children, the marriage breaking down in 1881 because of her drinking and his philandering. By August 1888 Nichols was living a marginal existence in the workhouses and common lodging houses of the East End. 47-year-old unfortunate Annie Chapman was found dead in the back yard of 29 Hanbury Street at just before 6am. Chapman was last seen alive at around 5:30am, and the area was already bustling with people on their way to work. Jack was getting more audacious, especially as he had done far more than simply cut Chapman's throat. Her intestines had been lifted out and her pelvic organs had been removed. Dr George Bagster Phillips said this was clearly the work of a skilled anatomist, and debate has raged on this point ever since. I recommend The Real Mary Kelly written by Wynne Weston-Davies, a former surgeon, for more insight into why the killer more than likely did have medical training. 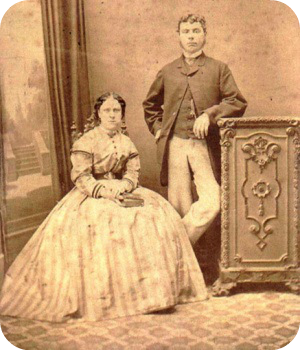 Eliza Ann Chapman (nee Smith) with her husband John in about 1868. Both took to the bottle after the death of their first born, Emily Ruth, from meningitis in 1882 and they separated in 1884. By 1888 Chapman was scraping a living by selling flowers, crocheting, and occasional prostitution. She had been ill for days before her murder, but was driven out on the streets by a lack of money for her bed. Ever since Nichols' death local prostitutes had been telling the press of a feared character known as 'Leather Apron' who regularly threatened women. The public took the moniker to heart; boys went around inciting angry mobs by yelling 'He's Leather Apron!' and a witness who saw one of the victim's (Liz Stride) with a client on the night of her murder told her that she ought to mind he wasn't Leather Apron out to get her. On September 10th Sergeant William Thick collared John Pizer who had been lying low, afraid he would be torn to pieces by angry vigilantes, in spite of having alibis for both murders. Pizer was subsequently cleared and compensated by the Star for their stories about him. If there was a Leather Apron, I don't think Pizer was he - Pizer was identified via help from Pearly Poll and her associates, and Sgt Thick (who would later serve as landlord for Jack London during his time among 'the people of the abyss') had earned his nickname 'Johnny Upright' ironically, if you believe Arthur Harding (one of Britain's first gangsters). 44-year-old unfortunate Elizabeth 'Long Liz' Stride was found dead at around 1:00 am, her throat cut, at the side of the International Working Men's Educational Club in Berner Street. Stride had been seen numerous times throughout the night, for all that some sightings were more plausible than others (e.g. Matthew Packer, shop keeper, had his 15 minutes of fame telling the newspapers about selling grapes to Stride and her killer), and one witness was deemed particularly important. Israel Schwartz saw a man assaulting a woman in Berner Street; the man called out 'Lipski' (the name of a famous murderer from 1887, and a common slur against Jews) and a second man, possibly an accomplice, chased Schwartz away. Of all the canonical five, Stride's death is the most likely not to be the work of Jack, given the lack of abdominal mutilation and the fact she had been recently quarreling with her on-and-off partner, Michael Kidney, a man she had previously had charged with assault. Police - and the press - were convinced her murder was the work of Jack, who had probably been scared off by the arrival of Louis Diemschutz (who found the body) with his pony and cart. It was this murder which also gave rise to the myth of Jack and the black medical bag. A witness saw a man carrying one rush past. Club member Leon Goldstein came forward, explaining he had been hurrying home, but the damage was done and the bags quickly fell out of fashion in the district. 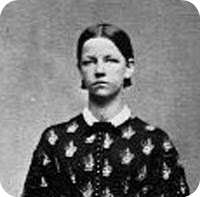 Liz Stride (nee Gustafsdotter) hailed from Sweden where she was a known prostitute. She emigrated to London in 1866 where she married ship's carpenter John Thomas Stride, and kept a Poplar coffee room. By 1881 it was all over and Stride earned her living through sewing, cleaning and prostitution, lying to friends that her husband and children had all died in the 1878 Princess Alice tragedy. She had a stormy relationship with Michael Kidney from 1884, and appeared numerous times before Thames Magistrate Court on drunk and disorderly charges, though was seemingly well liked and described as someone who would do a good turn for anyone. Less than an hour later the body of 46-year-old Catherine 'Kate' Eddowes was found by P.C. Edward Watkins in Mitre Square. Her throat had been cut, her abdomen mutilated, her face disfigured, and the killer had also found time to cut out part of her womb and her left kidney in the 14 or so minutes between Watkins' last walk through the Square. Eddowes and her common law husband, John Kelly, had returned from a poor season hop picking in Kent on Friday, and had pawned Kelly's boots for food money. By Saturday afternoon, penniless again, Eddowes said she was going to Bermondsey to ask her daughter for money. Annie Eddowes, tired of such requests, had moved while her mother was away, though she must have found money somewhere because at 8pm P.C. Louis Robinson found Eddowes blind drunk in a heap on Aldgate High Street. Eddowes was taken into police custody to sleep it off, being released at 1:00 am when she told P.C. Hutt she was in for 'a damn fine hiding' when she got home. Joseph Lawende, walking home with friends Joseph Hyam Levy and Harry Harris, saw Eddowes talking to a man at the corner of Duke Street and Church Passage at about 1:35 am. Ten minutes later she was dead. 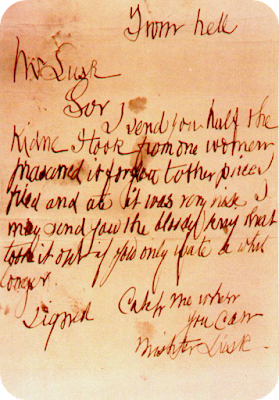 Part of Eddowes' apron was found in Goulston Street at about 3:00 am by P.C. Alfred Long. Above it, above the entranceway into the Model Dwellings (a primarily Jewish tenement building), was the chalked message 'The Juwes are not the men who will be blamed for nothing'. (There are a number of versions of what was written, but this one recorded by D.C. Daniel Halse is generally considered to be the most reliable.) Memories of Lipski and Leather Apron meant anti-Semitic feeling was at fever pitch in the East End and, though the City Police wanted the writing photographed, the Metropolitan Police ordered it be wiped away before the market began setting up and a riot resulted. All things considered, it was likely unconnected graffiti, of the type to be found all over the East End. Much has been made in recent years of a shawl supposedly belonging to Eddowes, taken from the scene of crime by Acting Sergeant Amos Simpson. (Naming Jack the Ripper - Russell Edwards, 2014.) The DNA analysis on this is very probably flawed given the high chances of contamination but, more importantly, it is 99% certain it never belonged to Eddowes anyway. The day before she had pawned Kelly's boots to buy breakfast - a silk shawl, if she possessed it, would probably be found or stolen, and would have doubtless be confiscated on that suspicion when she was taken into custody for being drunk and disorderly. The other option is that it was given to her by the killer which, I suppose, is possible but still unlikely. Catherine Eddowes left a respectable home with her aunt to be common law wife to Thomas Conway, with whom she had three children and made a living hawking cheap pamphlets and gallows ballads. The couple split in 1881, Eddowes taking her daughter who married shortly afterwards. In this same period Eddowes began living as common law wife to John Kelly, the pair earning their living through whatever work they could get - though Kelly was adamant that Eddowes had never resorted to prostitution. Pieces of a woman's body were found on the building site that was to become Scotland Yard. The police claimed there was no connection between this and the Whitechapel Murders, although the press were somewhat less convinced. In fact it was part of a whole series of 'Thames Torso Murders' carried out between 1887 and 1889 - for more info click HERE. 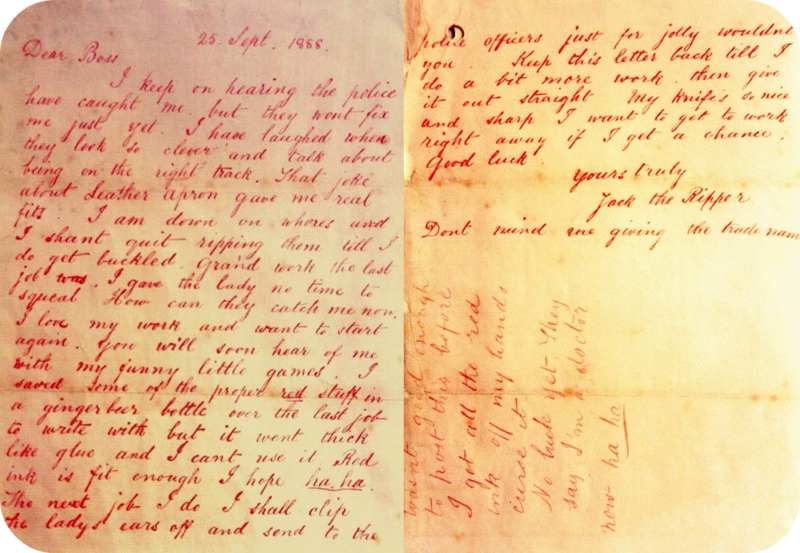 George Lusk, the Chairman of the Whitechapel Vigilance Committee, received a rather gruesome communication. In a box accompanied by the 'From Hell' letter was a kidney. At first Lusk dismissed it as a horrid prank, but was later convinced to have it examined by an expert. They confirmed that it was part of a human kidney, and passed it onto colleagues for further examination. Initial press reports about this claimed the doctors had confirmed it was part of the left kidney of a woman, aged around 45 and an alcoholic. 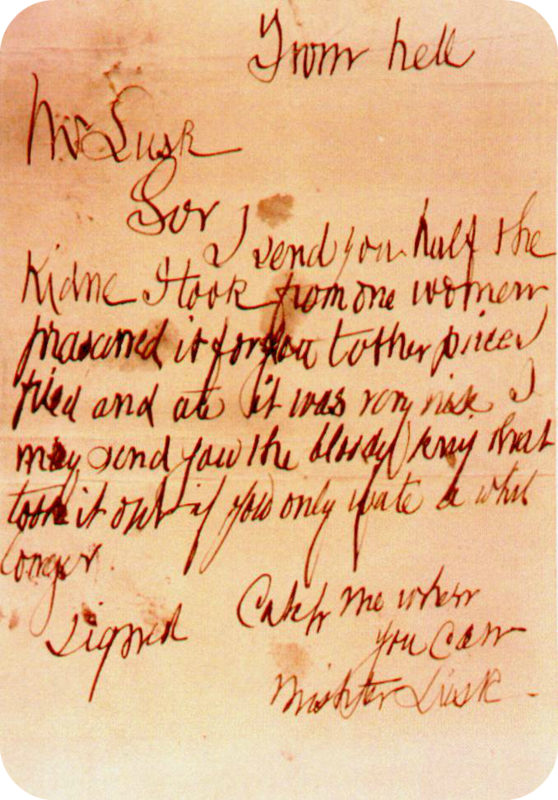 Most of this was later disputed, though they agreed that it was a human kidney and could be the kidney taken from Catherine Eddowes' body. Of all the communications reportedly from Jack, this is the one I would consider most likely to be genuine - though I tend to think that none of them were. 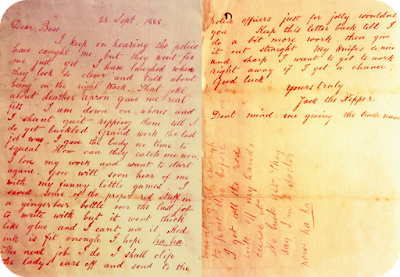 The 'From Hell' letter sent to George Lusk. Mary Jane Kelly was found mutilated beyond all recognition in her room in Miller's Court, otherwise known as McCarthy's Rents, by said landlord's rent collector at about 11:00 am. Although it was the day of the Lord Mayor's Parade, police were soon struggling to keep the curious crowds out of Miller's Court while they waited for the arrival of Burgho and Barnaby the bloodhounds - unaware that the dogs had been sent home to their owner. McCarthy finally forced the door well after midday, allowing the doctors and police photographer to do their work. Dr Bond's report makes incredibly grim reading; the carnage was extensive, her face was all but obliterated and, although there is some disagreement on the point, her heart was most likely taken away by the killer. Kelly is a mystery in her own right. She told friends she had been born in Limerick and raised in Carmarthenshire with her eight siblings, one of whom was now on the London stage and another (Johnto) was a member of the 2nd Battalion Scots Guards. At 16 she married a collier named Davies who died in a pit explosion and left her a widow by the age of 20. From there she went to Cardiff, where she was led astray by a cousin, then onto the West End where she worked in a high class brothel. For a time she went with a client to France, where she picked up her preferred name of Marie Jeanette Kelly, then (1886) went to live in what was likely a brothel run by Mrs Boeku and Johannes Morganstern in Breezer's Hill. #13 Miller's Court. The key had gone missing but the bottom right window pane had been broken during a drunken accident, and a hand could be reached through to open the latch. It is only from this point on that we can verify anything about her life. When her rent arrears built she moved next door with a Mrs McCarthy, though Mrs Boeku accompanied her to Knightsbridge to collect a trunk of fine clothing from a French lady (presumably handed over in lieu of Kelly's rent money). Mrs McCarthy and her sister Mrs Elizabeth Felix (wife of Adrianus Felix AKA Morganstern) later told the Star newspaper that Kelly was educated, an accomplished artist, spoke fluent Welsh and was an all round lovely girl - providing she was sober. 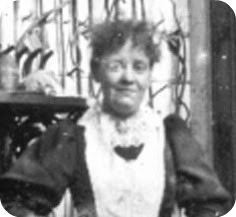 In late 1886 a man thought to be her father came looking for her, and Kelly moved in with Joseph Flemming, a plasterer in Bethnal Green, before meeting Joe Barnett in April 1887. The following day they moved in together. 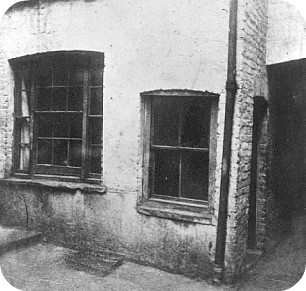 By spring 1888 they were living in the single room that made up #13 Miller's Court for the princely sum of 4s/6d a week. It was too much. Joe had been a fish porter at Billingsgate Market but had lost his license (probably due to thieving), and their rent arrears forced Kelly back to street walking, much to Barnett's distaste. Kelly took to letting her friends stay the night and Barnett, unwilling to share his lodgings with prostitutes, walked out at the end of October. They remained friends though, and Barnett visited her on the night of the 8th, apologetic that he had no money to give her. He left at 8:00 pm for his own lodgings. John McCarthy, owner of a chandler's shop and various properties in the area. McCarthy was a prominent local figure, and may well have been involved in less than legal activities such as pimping and extortion. There was a possible sighting of a very drunk Kelly in the Britannia at 11:00 pm, then at 11:45 pm Mary Ann Cox of #5 Miller's Court saw a man accompanying Kelly into her room. Kelly was singing 'A Violet I Picked From My Mother's Grave', heard by Catherine Pickett and her husband at 12:30 am, and again by Mary Ann Cox at 1:00 am. At 2:00 am George Hutchinson, client and admirer of Kelly's, saw her on Flower and Dean Street where she asked him to lend her sixpence. He didn't, but did follow her and a new client back to Miller's Court, outside of which he loitered until 3:00 am. Sarah Lewis and Elizabeth Prater, who lived above Kelly, heard a faint cry of 'Murder' about 4:00 am but took no notice, the cry being so common in the neighbourhood. This was determined by the doctors to be the time of death. The account is quite detailed because this is where it gets strange. At 8:30 am Caroline Maxwell, a lodging house deputy, saw Kelly outside the Britannia where she spoke to her for a few minutes. At 10:00 am Maurice Lewis also claimed to have seen Kelly. It's not impossible that this was so - the doctors couldn't enter the room for hours, and there is some argument that the conditions (broken windows, etc) might have led them to think death had taken place earlier. Some even argue that it wasn't actually Kelly on the bed, and a deliberate false identification was made. I wouldn't go that far, but I don't rule out the later time of death, especially given how daylight and the threat of discovery hadn't made much difference to the killer in previous murders. Kelly was apparently well known to the local constables, no doubt due to her relative youth and good looks, but despite intensive searching and press coverage no family members ever came forward. Researchers have met a similar dead end, ensuring that Kelly remains the most written about of Jack's victims. 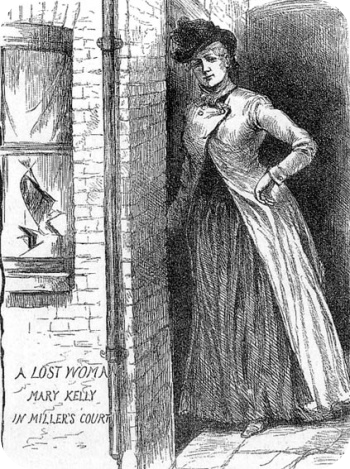 Kelly was the last canonical victim of Jack the Ripper, though the press made a meal of every prostitute murdered in the Whitechapel area for years to come. Perhaps most disturbing was the murder of Kitty Ronan in July 1909. It was over 20 years since Kelly's murder, but another young prostitute had her throat cut in her lodgings in Miller's Court. (Her killer was later identified and I'll write about that some other time but, really, Miller's Court could not have had good vibes!) 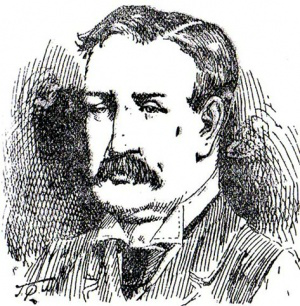 The case prompted Kit Watkins of the Toronto Mail to recall her visit to the scene in 1892. The place was 'reeking with filth and crowded with women and children', all keen to tell her about the night of Kelly's murder. Elizabeth Prater, who had been living in the room above Kelly's in 1888, was now living in the house opposite, while a woman named Lottie was now occupying Kelly's old room. She struggled to talk because of a broken nose her husband had given her, but told Kit that she had been living in Miller's Court in '88 and had been Kelly's friend. Kelly, she said, had told her: "I'm afraid to go out alone at night because of a dream I had that a man was murdering me. Maybe I'll be next. They say Jack's been busy in this quarter." Lottie went on: "She said it with such a laugh ma'am that it just made me creep. And been sure enough ma'am she was the next to go. I heard her through the night singin' - she had a nice voice - "The violets grow on your mothers grave" - but that's all we 'urd." The worst thing though, the absolute worst, was that the walls of #13 hadn't even been whitewashed. Lottie and her husband lived in a room with blood covered walls. The upside, if there could be an upside, of the 'Autumn of Terror' is often said to be a new awareness of the plight of London's poor and an improvement in living conditions. But that improvement was slow, and gradual, and for women like Elizabeth Prater and Lottie and poor Kitty Ronan, it came too late, if it ever came at all.